In Comparison To Previous One, Sleepover Slaughter/Episode 2 Of The Visitor Game Series Is Shorter But Not So Easy. You Can Complete This Game In Just 10 Minutes[Really? Yes If You Know How To Solve Puzzles]. 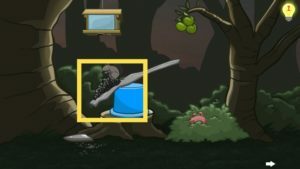 Overview – In Sleepover Slaughter, You Play As A Tiny Alien Creature And Your Goal Is To Kill All Of The Characters Of This Game – One Animal, One Male, And Three Females/Social Media Lovers – Kelly, Misty, And Stacey. All Of Them Are Waiting For The Guy Who Is Busy On His Mobile. You Are Outside Of The House. And How To Eat Them? The Visitor Ep.2 Sleepover Slaughter Is A Point And Click Game Like The First Part. 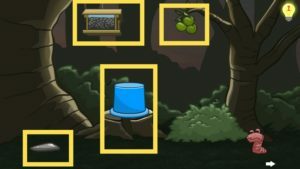 You Use Different-Different Objects In This Game To Solve These Puzzles. The Visitor Ep.2 Sleepover Slaughter Is Divided Into 5 Parts. In Each Part Of The Game, You Eat Someone. The Alien Creature Is Really Hungry! Step 1.) Go To The Back Part Of Neighbour House. You Just Have To Click Where You Want To Go. So Head To Back Yard Of The Neighbour House. Step 2.) Now, There Are Some Objects That You Have To Use. ⇒Bucket, Pipe, And Vent. 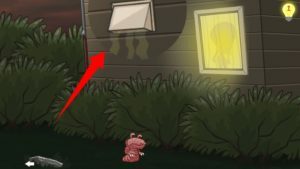 Vent Will Be Used To Enter Into 2nd Part Of Sleepover Slaughter When You Eat Squirrel. Now, Tap On Bucket And Go To Next Scene[Tap On Arrow Option At The Bottom Left]. There You Will See A Cutted Tree, Apple On The Tree, A Stone Type Material, Food Item Hanging On The Tree. Step 3.) Place The Bucket On The Cutted Tree. Pick Bucket From Scene 1, Then Go To Scene 2. Place The Bucket There. Step 4.) Go To Scene 1 Again, Tap On Pipe[See Pic 1 Of Walkthrough]. Once Picked, Go To Scene 2, Place On The Bucket. Step 5.) After That, Place The Stone Type Material On The Pipe[In Scene 2]. Step 6.) Now, Tap On Apples. This Will Drop The Apple On The Pipe And Stone Type Material Will Break The Box Containing Food Material. Step 7.) Go To Bushes[Tap On Bushes]. Wait A Moment, Squirrel Will Come And Start Eating Food. Now, Get Out Of Bushes And Tap On Apple Again To Eat Squirrel. That’s It. 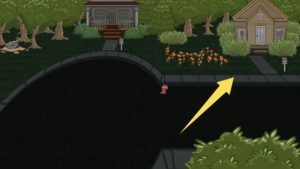 To Enter Into 2nd Part Of The Sleepover Slaughter, Go To Scene 1[Back Yard] And Tap On Vent. The Visitor Episode 2 - "Sleepover Slaughter"
Previous Post:Oddworld: New’n’Tasty , Finally On Android! !